Plasmid-encoded extended-spectrum beta-lactamase (ESBL)-enzymes are frequently produced by Escherichia coli. Several ESBL-plasmids contain genes for toxin-antitoxin (TA) systems, which assure the maintenance of plasmids in bacteria and prevent the cells from “post-segregational killing”. These systems limit options to “cure” plasmids of ESBL-wild-type strains due to the death of the bacterial cells. A helpful tool to understand the role of ESBL-plasmids in the dissemination of pandemic multi-resistant E. coli are ESBL-plasmid-“cured”-variants (PCVs) and their comparison to ESBL-wild-type strains. The purpose of this study was to construct PCVs of ESBL-wild-type E. coli strains despite the presence of genes for TA systems. Using enhanced temperatures and brain-heart-infusion broth it was possible to construct viable PCVs of wild-type ESBL-E. coli strains. The occurrence of TA system-genes including hok/sok, srnB/C, vagC/D, pemI/K on ESBL-plasmids of replicon types FIA or FIB was demonstrated by bioinformatic analyses. 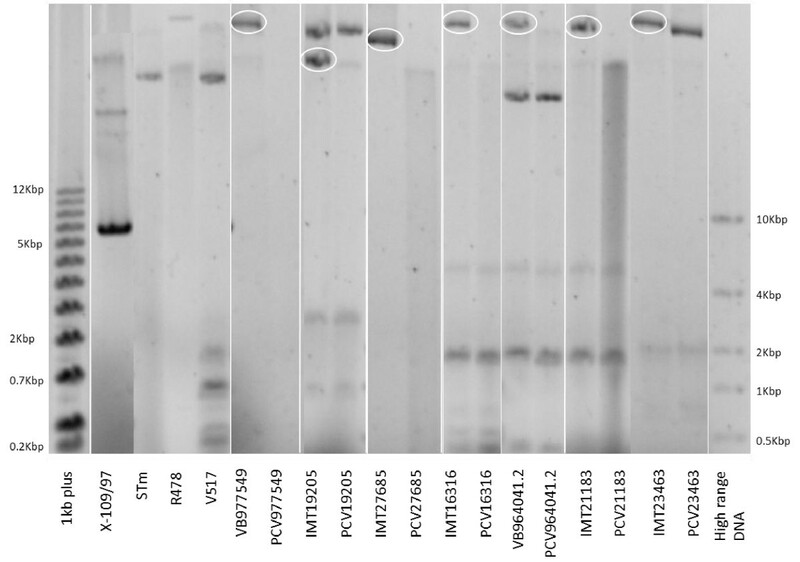 The loss of the plasmid and the genetic identity of PCV and corresponding wild-type strain was confirmed via different methods including plasmid-profile-analysis, pulsed-field gel electrophoresis and bioinformatics using generated whole genome data of the strains. This short report describes the successful construction of viable PCVs of ESBL-wild-type E. coli strains. The results are hence surprising due to the fact that all “cured” ESBL-plasmids contained at least one complete toxin-antitoxin system, whose loss would normally mean the death of bacterial cells. Pathogenic Escherichia coli cause a wide range of infectious diseases in various animal species and humans, including diarrhoea , meningitis, urinary tract and, soft tissue infections . Many E. coli produce extended-spectrum beta-lactamase (ESBL)-enzymes, which- in addition to penicillins and others- hydrolyse newer, third-generation cephalosporins and monobactams , and limit antimicrobial therapy. Several ESBL-gene families (blaCTX-M, blaSHV, blaTEM and blaOXA) are encoded on plasmids . Prior research has demonstrated that some of the ESBL-carrying plasmids influence factors other than resistance, like the ability of Klebsiella strains to invade epithelial cells . In these ESBL-plasmids, addiction models such as toxin-antitoxin (TA) systems have been described , which prevent the cell from “post-segregational killing”, therefore ensuring the maintenance of the plasmid in the bacterial cell during replication . Several TA systems have been discovered in Gram-negative and Gram-positive bacteria differing basically in functionality and type of the antitoxin. Type I system antitoxins are small antisense RNA molecules, which mostly inhibit toxin mRNA translation or degrade toxin mRNA while type II system protein antitoxins interact post-translationally with protein toxins. Other systems are type III to type V TA systems [8–10]. One of the first  and most studied is type I hok/sok TA system in E. coli. Following replication, in plasmid-free daughter cells type I unstable RNA antitoxin molecules (e.g. sok) degrade rapidly, while stable toxins (e.g. hok) induce cell membrane porins, therefore impairing ATP synthesis and subsequently causing bacterial cell death . In ESBL-plasmids most frequently represented systems not only include hok/sok but also pemK/I and ccdA/B, which seem to be associated with CTX-M-15 and CTX-M-9 encoding plasmids of IncF replicon type . To investigate, which important role ESBL-plasmids play concerning both resistance and factors not related to resistance it is necessary to construct ESBL-plasmid-“cured”-variants (PCVs) and compare those pheno- and genotypically to ESBL-wild-type strains. Different methods are known to “cure” bacterial plasmids, most of them use chemical treatment like ethidium bromide or acridine orange in different concentrations added to bacteria in Luria-Broth (LB) . These methods often involve the problem that “curing” the ESBL-plasmid of the wild-type strain causes the death of the bacterium due to the loss of an operating TA system. In this study we “cured” TA systems-containing ESBL-plasmids from wild-type E. coli testing an established method  using enhanced temperatures, brain-heart-infusion (BHI) medium and several weeks of continuing sub-cultivation protocols. To force the loss of the ESBL-plasmid, a heat technique was performed . Single colonies of seven wild-type ESBL-E. coli strains (VB977549, IMT19205, IMT27685, IMT16316, VB964041.2, IMT21183, IMT23463 of successful and pandemic sequence types [STs] ST131 and ST648 and different hosts including humans, companion and wild animals (Table 1)) were picked and inoculated in 5 ml BHI broth. BHI tubes were incubated at 45°C for 24 hours. Ten microliters of the overnight culture were spread on CHROMagarTM plates. Plates were incubated at 37°C overnight. Replicate CHROMagarTM plates containing an identical numbered grid on the backside of the plate were then prepared. One contained cefotaxime (4 μg/ml cefotaxime) and the other was prepared without supplementation of antibiotics. Twenty single colonies of each strain were randomly picked from the overnight incubated CHROMagar® plate and single colonies were placed on their identical grid locations in the agar of the replicate plates. This was to ensure that colonies from the two different plates could be assigned to the previously selected, single colony. ESBL-plasmid-“cured” single clones should not grow on cefotaxime-containing plates. These visually “cured” single clones were picked from the corresponding CHROMagarTM plate without cefotaxime according to the grid and their phenotypic resistance against cefotaxime and other antimicrobial classes (Table 2) was screened using agar disc diffusion according to the CLSI method . They were further investigated using plasmid-profile-analysis to prove the loss of the plasmid . Clonal identity of the wild-type and the ESBL-plasmid-“cured”-variant was tested via Xba I-pulsed-field gel electrophoresis (PFGE)  and following comparative bioinformatic analyses. First, the number of orthologous genes in a pairwise comparison of the genome of the wild-type strain and the corresponding plasmid-“cured”-variant was checked using the OrthoMCL pipeline . In a second approach the phylogenetic distances of all strains were tested. The set of genes, which is present in each of all strains, the Maximum Common Genome (MCG), was therefore calculated, the allelic variants of the MCG from the strains was then extracted and a multiple alignment was built (Semmler, personal communication). Verified ESBL-plasmid-free strains were henceforward named PCV (plasmid-“cured” variant: PCV977549, PCV19205, PCV27685, PCV16316, PCV964041.2, PCV21183 and PCV23463). Presence of genes for TA systems on plasmids was investigated evaluating sequence data using bioinformatic methods. Both wild-type strains as well as PCVs were sequenced by an Illumina HiSeq 2000 sequencer. The resulting reads for the PCVs were used for a de novo assembly (CLC Genomics Workbench 6.5, CLC Bio, Denmark). The contigs were then used as reference sequences for a reference mapping of the reads from the wild-type strains. All reads from the wild-type strains, which could not be mapped to the PCV sequence are supposed to represent the extracted plasmids and were used for another de novo assembly, which resulted in the contigs of the plasmid sequences. Using BLAST for the plasmid and the PCV contigs, the genes for TA systems could be localized. Other plasmid-“curing” methods including treatment of bacteria with acridine orange and ethidium bromide  were additionally tested and modified, however, as they turned out not to be successful, data are not included in this manuscript. blaTEM-1, tet(A), sul2, strA, aac(3)-IV, aac(6’)-Ib-cr. (R = resistant, S = sensitive, I = intermediate). Treatment of bacteria with enhanced temperatures was performed to construct viable toxin-antitoxin system-containing ESBL-plasmid-“cured”-variants of wild-type ESBL-E. coli strains. Following three to six weeks of daily sub-cultivation, examination of the phenotypical resistance status of the wild-type ESBL-strains revealed seven cefotaxime-susceptible and phenotypically ESBL-plasmid-“cured”-variants. Table 2 shows the results of agar disc diffusion testing of cefotaxime and other classes of antimicrobials. All PCVs lost their cefotaxime resistance along with most of the non-beta lactam resistances. Clonal identity of the PCV and its wild-type strain was proven via pulsed-field gel electrophoresis (Figure 1) and bioinformatic analyses. 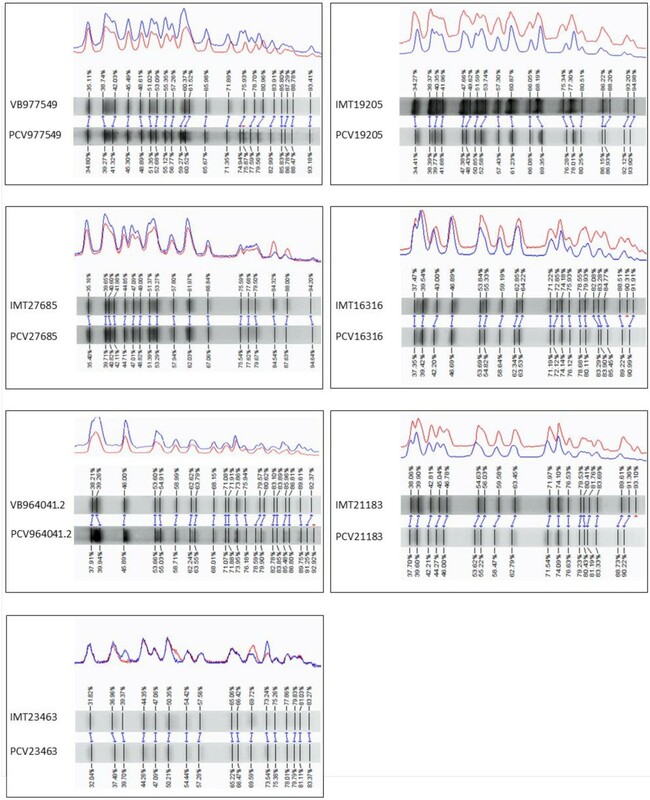 The seven PCV strains showed a highly similar macrorestriction pattern compared to their corresponding wild-type strain. For most of the PCV strains, a small band was missing in the patterns, which might be the “cured” plasmid itself (PCV977549, PCV16316, PCV964041.2 and PCV21183). Comparing orthologous genes, similar results were obtained for all pairs, which showed only one significant excess of genes in the wild-type strain without an ortholog in the “cured”-variant in an amount that corresponds to the size of the plasmid. In case of phylogenetic distances a clustering confirmed the genetic identity for each pair of wild-type and plasmid-“cured”-variant strain (data not shown). The loss of large plasmids (>100 kb) was approved via plasmid-profile-analysis (Figure 2). Plasmid-profile analysis revealed no loss of other smaller plasmids apart from the large ESBL-resistance plasmids. Bioinformatic analyses confirmed the presence of different TA system-genes on plasmids including hok/sok, srnB/C, vagC/D, pemI/K. All but one wild-type strain (IMT19205) carried ESBL-plasmids encoding for multiple TA systems, whereat all plasmids belonged either to replicon types FIA or FIB (Table 1). Dendrograms of the pulsed-field gel electrophoresis. Wild-type ESBL-E. coli and PCV strains after macrorestriction with Xba I and PFGE (dice similarity value >98% for all strains). Software: Bionumerics (Applied Maths, Belgium). Electropherogram of the plasmid-profile-analysis. Wild-type (IMT/VB, left) and ESBL-plasmid-“cured” variants (PCVs, right) illustrated in pairs. Revolved in white are the big plasmids in the ESBL-wild-type strains, which have been “cured” in the corresponding PCVs. At the beginning and the end are several markers (1 kb plus [Thermo Scientific, USA], X-109/97 [12,5MDa], STm [60MDa], R478 [166MDa], V517 [36.8/4.8/3.7/2.0/1.8/1.4], FastRuler High range DNA [ThermoScientific USA]). As ESBL-plasmid-“curing” of the strains applied in this study did not work treating bacteria with ethidium bromide or acridine orange a previously described method  using a heat technique was performed. This method was adequate to construct viable PCVs and to our knowledge we are the first ones to describe a successful “curing” of ESBL-plasmids, which carry genes for toxin-antitoxin systems. The results are surprising because one might think that bacteria cannot survive without this plasmid. Strains used in this study all had at least one complete ESBL-plasmid-encoded toxin-antitoxin system, including hok/sok, srnB/C, vagC/D and pemI/K, which were encoded on plasmids of replicon types FIA or FIB carrying blaCTX-M-9, blaCTX-M-14 and blaCTX-M-15 or combinations of these three ESBL-genes. The addiction systems and replicon types found have been characterized in ESBL-producing E. coli before and certain combinations of ESBL-enzyme, addiction systems and replicon type might contribute to the success and spread of multi-resistant E. coli strains . An association of CTX-M-15 with FIA and CTX-M-9 with FIB plasmids has been described before and the same was true for the isolates used in this study (Table 1). Mnif et al. also observed that the occurrence of CTX-M-14 correlated with FII replicons, however, FIB replicon type plasmids carrying CTX-M-14 have also been found in this earlier study . No correlation for CTX-M-14 and FII replicons was observed in this study, as this ESBL-type was also present on FIA/FIB plasmids (Table 1). This might be partly due to the fact that blaCTX-M-14 was only detected in combination with other CTX-M enzymes (Table 1). So why did bacteria, whose TA system-containing plasmid was “cured” using a heat technique, survive? One might speculate that some toxins degenerate irreversibly above certain temperatures or that the TA genes are not expressed at 45°C. Or is it that continuing soft stimulation using high temperatures allows a slow adaption to changing environmental conditions and therefore “curing” of the plasmid, while chemicals, like ethidium bromide, together with the loss of a TA system mean too much stress for bacteria? Pulsed-field gel electrophoresis, plasmid-profile-analysis and bioinformatic analyses confirmed that the genetic change is restricted solely to the loss of an ESBL-plasmid and that genetic identity of PCV and wild-type strain remains given. Constructed PCV strains might be important tools to investigate the influence of an ESBL-plasmid on its bacterial host. Katharina Schaufler was supported by the SONNENFELD-STIFTUNG (doctoral stipend) and Sebastian Guenther was supported by a grant of the German Research Foundation entitled “Functional analysis of non-resistance genes of extended-spectrum beta-lactamases associated sequence types of Escherichia coli” (grant GU1283/3-1). Torsten Semmler was supported by Research Network Zoonosis FBI-Zoo (grant 01KI1012A). We would like to thank Ivonne Stamm (IDEXX, Ludwigsburg, Germany) for providing two and Ivan Literak (University of Veterinary and Pharmaceutical Sciences, Brno, Czech Republic) for providing one of the used strains. We acknowledge the support of the Wellcome Trust Sanger Institute core sequencing and informatics teams (Derek Pickard). KS designed and performed the experiments, structured and prepared the manuscript. CE and LHW drafted and revised the manuscript critically for important intellectual content and took part in writing of the manuscript. TS performed bioinformatic analyses. SG participated in the design of the study, revised the manuscript critically for important intellectual content and took part in writing. All authors read and approved the final manuscript.